Apalachicola National Estuarine Reserve- Over 246,000 acres in the Apalachicola Bay. Visit the interactive Educational Center located just across the Apalachicola Bridge at 108 Island Drive in Eastpoint. 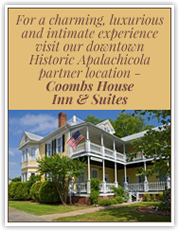 Orman House Historic State Park- Built in 1838 by Thomas Orman, this antebellum home overlooks the Apalachicola River and Guided tours are offered hourly, except noon. Visit the adjoining Chapman Botanical Garden, which honors Dr. Alvin Chapman. Enjoy the butterfly garden, other botanical features, walkways and open spaces. Also enjoy the Three Soldiers Detail, a bronze replica of the Vietnam memorial statue in Washington, D.C.
St. George Island Lighthouse- Climb the 92 stairs of the Cape St. George Light to see breathtaking views of the Gulf of Mexico, Apalachicola Bay, and St. George Sound. St. Joseph Peninsula State Park- excellent snorkeling, swimming, birding and hiking.